On the occasion of director Tim Burton being honored at the Chinese Theatre in Hollywood, I revisited much of what composer Danny Elfman has told me over the years about their long working relationship. It’s amazing when you consider the number of classic, and award-winning, scores they’ve done together over the years, including Batman, Edward Scissorhands, Beetlejuice, Mars Attacks! and more. 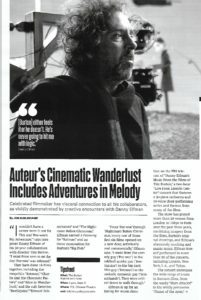 My story leads the Tim Burton section in this week’s edition of Variety. This entry was posted in Composers, Film Music, Interviews and tagged Batman, Batman music, Beetlejuice, Danny Elfman, Edward Scissorhands, Mars Attacks!, Tim Burton, Variety on September 8, 2016 by Jon Burlingame.